Caption: Let Him put joy in you heart. This custom designed shadow box is a beautiful gift to commemorate a child's First Communion and also makes a special gift for any occasion. The box can sit on a shelf or be hung on the wall. The verse "Let Him put joy in your heart" is printed on the glass giving the piece dimension. 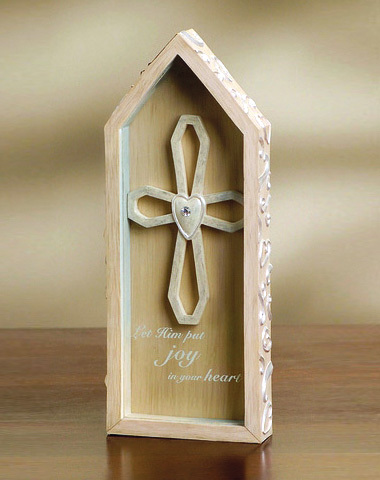 The die cut cross has a crystal in the center.